and these basics are the essential requirement for successfully breeding Oriental Frills. top quality Oriental Frills are well worth the time and effort you put into your program. successful you are with these skills will pay dividends in the breeding and show pen. 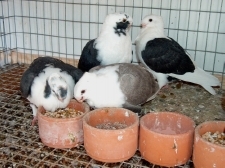 attention in the everyday routine of pigeon raising so keep it enjoyable, rather than a burden. and feed budget should be considered. 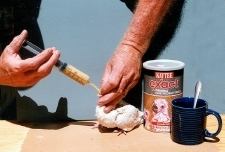 care for top quality birds as it does for culls. up. The higher the quality of your young Oriental Frillsthe more difficult they will be to rear. square feet of floor space for each breeding pair or 40 to 50 cubic feet, depending on the ceiling height. health and ability to breed or rear healthy youngsters. learn to eat and drink from watching their parents. When they have been taught to eat and drink in the nest, weaning is much less stressful. Be diligent in providing clean water and feed at each feeding. It is also important to provide good nesting material. I prefer long pine needles and make it available for the birds in the fly pen so they can fill their own nest bowls. This is natural and enjoyable for them, as well as providing good exercise. have learned from others and my own experiences. 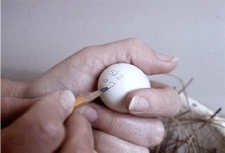 type of code, pair #, date, etc., using a pencil, not a marker pen as it can be lethal. to take food. 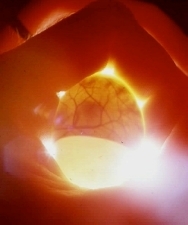 Photo showing an egg being candled at 4 to 5 days after laying. drink just as it would from the parent’s mouth. days. During this time they will grow rapidly. poorer quality baby to avoid loosing the stronger beaked youngster. their beaks in the water a couple times and remove the feed dish so they don’t over eat. bowl soon after being released. Young Turbiteens & Turbits eating grain & grit in a weaning pen. 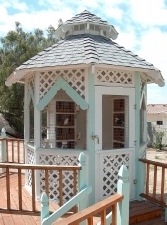 Breeder`s gazebo loft, screened on 5 of 8 sides with wire floor and roof vent for fresh air flow and keeping the loft cool in hotter weather. 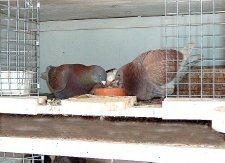 Foster parents teaching a young Turbit to eat grain in the nest box. 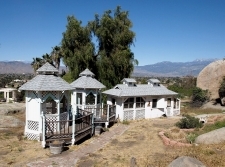 The author's hillside "Pachea Trail Lofts" in Hemet, CA. 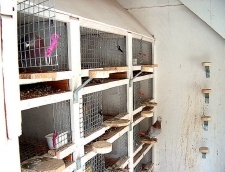 The two gazebo style lofts house the breeders and young birds and larger building has the feed room with mating and weaning pens and foster parents loft on right side with fly-pen. Foster parents nestbox with space for double nesting, water and feed. With grill floor for easy cleaning.